Mouse monoclonal Hsp70 antibody [C92F3A-5]. Validated in WB, IP, ELISA, IHC, Flow Cyt, EM, ICC/IF and tested in Rat, Human. Cited in 23 publication(s). Independently reviewed in 3 review(s). Detects a 70kDa protein corresponding to the molecular mass of Hsp70 of SDS PAGE immunoblots. There is no cross-reactivity to Hsc70 (Hsp73). Recombinant fragment corresponding to Human Hsp70 aa 436-503. The mapped epitope is in the region of amino acid residues 436-503. WB: HeLa, A431, A549, HCT116, HEK293, HepG2, HL-60, HUVEC, Jurkat, MCF7, PC3, T98G cell lysates; Rat Brain tumour lysate; Rat bone lysate. IHC-P: Mouse colon cancer tissue; human colon cancer tissue. Flow cyt: HeLa cells. Our Abpromise guarantee covers the use of ab47455 in the following tested applications. WB Use a concentration of 1 µg/ml. Predicted molecular weight: 70 kDa. Function: In cooperation with other chaperones, the Hsp70 family stabilize preexistent proteins against aggregation and mediate the folding of newly translated polypeptides in the cytosol as well as within organelles. These chaperones participate in all these processes through their ability to recognize nonnative conformations of other proteins. They bind extended peptide segments with a net hydrophobic character exposed by polypeptides during translation and membrane translocation, or following stress-induced damage. In case of rotavirus A infection, serves as a post-attachment receptor for the virus to facilitate entry into the cell. Tissue specificity: HSPA1B is testis-specific. Cytoplasm. Localized in cytoplasmic mRNP granules containing untranslated mRNAs. All are cancer cell lines. Formalin-fixed, paraffin-embedded human colon carcinoma tissue stained for Hsp70 using ab47455 at 1/1000 dilution in immunohistochemical analysis. Counter stained with hematoxylin. ab47455 staining Hsp70 in mouse colon cancer tissue section by Immunohistochemistry (Bouin's fixed paraffin embedded tissue sections). The primary antibody was diluted at 1/100,000. A Fluorophore conjugated goat anti mouse was used as secondary. An antibody amplifier™ system was used for staining. Overlay histogram showing HeLa cells stained with ab47455 (red line). The cells were fixed with methanol (5 min) and then permeabilized with 0.1% PBS-Tween for 20 min. The cells were then incubated in 1x PBS / 10% normal goat serum / 0.3M glycine to block non-specific protein-protein interactions followed by the antibody (ab47455, 1µg/1x106 cells) for 30 min at 22°C. The secondary antibody used was DyLight® 488 goat anti-mouse IgG (H+L) (ab96879) at 1:500 dilution for 30 min at 22°C. Isotype control antibody (black line) was mouse IgG1 [ICIGG1] (ab91353, 2µg/1x106 cells) used under the same conditions. Acquisition of >5,000 events was performed. This antibody gave a significantly decreased signal in HeLa cells fixed with 4% paraformaldehyde (10 min)/permeabilized in 0.1% PBS-Tween used under the same conditions. Publishing research using ab47455? Please let us know so that we can cite the reference in this datasheet. One last question, in totally normal cells will I get a band of HSP 70 (not HSP73) in WB? I learned that HSP 73 is constitutionally produced by cells, while HSP70 protein is induced by heat, injury, which makes me to think that HSP70 would not appear in normal cell. Is this correct? Yes, this product has been tested sucessfully in rabbit for Western Blotting. Our results show a clean band. The antibody should specifically detect HSP70 and not HSP73. Regarding local injury, I am not sure whether your levels will be elevated or not. Cells that are heat shocked do increase HSP70 so it seems reasonable that this would appear in your staining but this would have to be tested. Sorry to bother you, but really need help. I bought the HSP70 antibody from your company. The product is Anti-Hsp70 antibody [C92F3A-5] ab47455. I have a few questions about the functions of the antibody. Some of the answers to them may seem easy to find on internet, but my english is not good enough, finding answers will be very annoying to me. So I want to ask for help from you. Thank you very much! 1, Is it applicable in rabbit experiment? I read the specification of the product, but I am still not sure about the question. I mean when I am doing a rabbit experiment, and I want to detect the HSP70 (induced by pressure), not HSP73 (constitutionally existing in cells), is it correct to use this product? 2,Does the HSP70 ( not HSP73) present in normal cells. 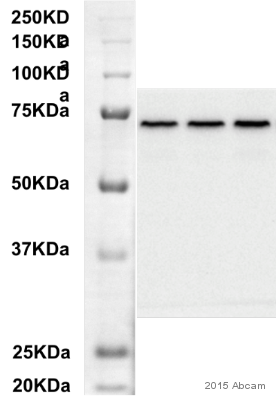 I mean if I measure the quantity of the HSP70 protein in a totally normal cell, will I get the protein band in Western blot? Will the band be very blurring? Or clear? 3,If I add a traumatic stimulant to the normal rabbit brain, I want to detect the HSP70 protein quantity around the lesion. Will I get the elevated HSP70 result? I read some papers on HSP70, and the elevated HSP70 results were all obtained by whole body overheated not just local injury. So I doubt the effect of the local injury. In normal cells there is still some low expression of HSP70, which is upregulated by heat or injury. I hope this information is helpfu. Verfahren teilzunehmen. Ist das für Sie so in Ordnung? Die Frau Hoffmann ist außer Haus und ich hoffe es ist Ihnen Recht, dass ich mich um Ihren Fall kümmere. Unser AbTrial ist nur ein Angebot, welches Sie nicht in Anspruch nehmen müssen. Natürlich können Sie jedes unserer Produkte bestellen dass Sie möchten ohne jegliche weitere Verpflichtung. Ich hoffe dies hilft Ihnen weiter und ich wünsche Ihnen viel Glück mit Ihren Versuchen. könnten, da ich nämlich ihre angegeben Antikörper gerne testen würde. Leider bieten wir generell keine Probegrößen zu Testzwecken an. Es ist logistisch bei über 95000 Produkten nicht möglich kleinere Größen anzubieten. Unserem Wissen nach wurden ab47455 und ab79648 bisher noch nicht in Aspergillus getestet. Falls Sie dies selbst testen möchten, kann ich Ihnen zurzeit ein spezielles Angebot über einen 100%igen Abreview-Rabatt anbieten. Bei diesem Angebot bekommen Sie einen Rabatt für eine zukünftige Bestellung, wenn Sie uns ein Abreview mit dem Testresultat zusenden. Der Rabatt würde den ganzen Wert von ab47455 und ab79648 abdecken, und gegen eine erneute Bestellung weitere Produkte von uns verrechnet werden. 1.) Bestätigen Sie mir bitte, dass Sie ab47455 und ab79648 in Aspergillus testen möchten. 2.) Bitte bestellen Sie erst nach Erhalt der Rabattcodes. 4.) Testen Sie den Antikörper in Aspergillus. 6.) Die Rabattcodes sind nach dem Abschicken des Abreviews aktiv, und Sie können weitere Produkte zu dem gleichen Preis wie ab47455 und ab79648 bei uns bestellen (halten Sie bei der Bestellung bitte den Rabattcode). Bitte beachten Sie, dass der Rabattcode innerhalb von 4 Monaten nach Ausstellung eingelöst werden muss. One of the IHC images says that the antibody was diluted 1:100,000. Is that correct, or do you recommend a higher concentration in IHC? Thank you very much for your call yesterday and for your patience while I've been in touch with the lab about ab47455. The antibody was used at a 1:100,000 dilution using a novel antibody amplification system, so these results are not typical and we recommend starting at a 1:1000 dilution. I am sorry for the confusion, but I hope that this information is useful. Please let me know if you have any questions or if there is anything else that we can do for you. sorry for the delayed answer, but we were discussing the issue internally and with some international drosophila researches. we think that another vial of ab47455 does not make that much sense; we can exclude heat or age damage on the antibody, as it reacted fine with human serum. there are currently no drosophila specific hsp70 antibodies, but some colleagues suggesteted that ab2787 or ab5439 might be suitable for our tests. i am aware that these antibodies do react with hcp70, but we could eliminate this effect be a revised experimental design. do you think that it is possible to receive a small aliquot (5-10 ul) of these two antibodies for test purposes? we would again set up elisas with dilution series of heat shocked and control human/droso protein and then decide if any of the antibodies is suitable for hsp detection in drosophila and can thus be orderd in full quantity, or if we have to produce a new clone from scratch. of course we would share the test results with you. I agree that it does seem more sensible to try a different antibody as the vial you initially received was showing activity with the human protein. The two alternatives you have suggested, ab2787 or ab5439, have unfortunately not been tested in ELISA by us as yet and I would therefore not be certain of their performance using thisapplication. Unfortunately, due to the size of our catalogue and the logistics involved, weare unable to provide sample sizes of antibodies. However, if you would like to try one of theseantibodies initially, I would be able to send you out a full vial to try, free of charge as a replacement forab47455 not working as expected. I would suggest that it may be beneficial to try performing a Western blot with your human and drosophila samples, just to check that the antibody is functioning as expected, prior to performing the ELISA with either of these antibodies. I have been using ab47455 for a couple years in IP and WB to detect HSP70. It has worked well in the past but two recent lots, GR61173 and GR40351, have not detected exogenous HSP70 or endogenous protein, as had been the case with previous lots. Other antibodies from different suppliers have detected HSP70 in these same samples. I have asked our accounting department to issue a credit note for you, which can be redeemed against the invoice of a future order by passing it on to your purchasing department. To avoid confusion, please ensure your accounts department is aware of how the credit note is being used. If you have questions on how to use the credit note, please contact our accounting department. we tried diferrent concentration. Pleaserefund all of them. Your credit note IDsare *******. Customer kindly called to discuss use of ab47455 and ab5442 in western blot on Bluegill (Lepomis macrochirus). I am very pleased to hear you would like to accept our offer and test ab47544 in Bluegill tissues. This code will give you: 1 free PRIMARY ANTIBODY OR VALUE OFF OF ORDER before the expiration date. To redeem this offer, please submit an Abreview for Bluegill/Fish and include this code in the “Additional Comments” section so we know the Abreview is for this promotion. For more information on how to submit an Abreview, please visit the site: www.abcam.com/Abreviews. Remember, we publish both positive and negative Abreviews on our datasheets so please submit the results of your tests. The code will be active once the Abreview has been submitted and can be redeemed in one of the following ways: 1) Call to place your order and mention the code to our customer service department; 2) Include the code in your fax order; 3) Place your order on the web and enter the promotional code. Any feedback that you can provide will be greatly appreciated, whether positive or negative. If you have any further questions, please do not hesitate to contact us. We look forward to receiving your Abreview and wish you luck with your research. The terms and conditions applicable to this offer can be found here: www.abcam.com/collaborationdiscount.